Established in November 2013, the company is wholly owned subsidiary of Enerfo Pte Ltd and it is strategically located in Singapore. Omegra Shipping Pte Ltd Singapore is a dry-cargo operator specialising in worldwide chartering and operations within the Handysize, Supramax and Panamax markets. Established in November 2013, the company is wholly owned subsidiary of Enerfo Pte Ltd and it is strategically located in Singapore, where all commercial and post-fixture activities are centralized. We provide professional advice, competitive freight solutions and sophisticated structures including COA,Index-linked contracts and Joint Ventures. We also offer solutions in commercial management of dry-bulk tonnage. A combination of in-depth market intelligence and close customer relationships provide us with an edge over our competitors in the market. To be the leading Dry-Bulk ship operators of choice in global tramp shipping space, having a unique business model and dynamic team that has the drive to make solid business decisions and take action. To be an integral part of the world’s economic engine, while honoring our commitments, delivering revenue outperformance and generating long term value for our shareholders. 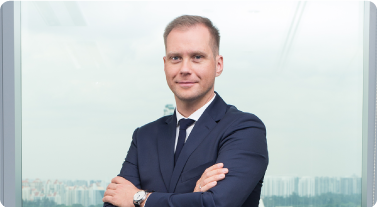 Lukasz is Director and Head of Shipping, responsible for overall operations including Strategic Planning, Position Management and Asset Management. He arrives with more than 10 years of international shipping experience (in Denmark, USA, UAE, Poland, Hong Kong and China) and an in-depth knowledge of Dry bulk freight. Through his experience and network, Lukasz has brought to the organisation an expertise of Ship Owning, Operating and Chartering and provided the Company with an edge over others. Prior to joining Omegra, he served for Pacific Basin Shipping in Hong Kong for 5 years as Chartering Manager responsible for managing trades and the commercial operations of the fleet. Lukasz graduated with a B.Sc. in Commodity and Cargo Science, a B.Sc. in Ship Management and Seaborne Trade and a Master of Science Degree in Transport of Hazardous Goods. He has completed Professional Qualifying Examinations at the Institute of Chartered Shipbrokers (with Distinction) and has attended several professional programmes including The Baltic Exchange, BIMCO and the International Executive Programme at INSEAD.